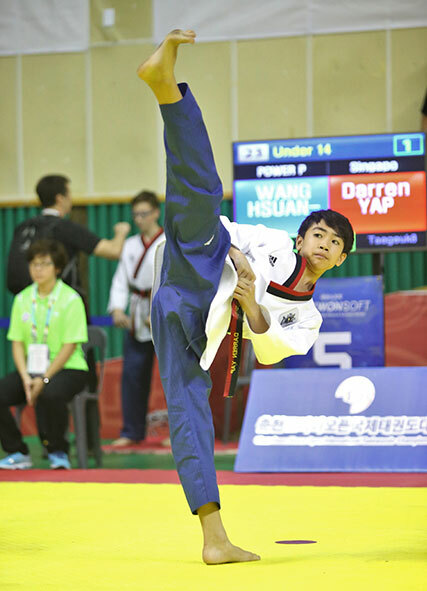 In addition to the regular training schedule, INDUK would field students to participate in various national or club competitions in both Poomsae (forms) and Kyorugi (sparring). Participation in competitions encourages commitment in young students and helps instill confidence and discipline. It also fosters friendship and esprit de corp among students as they train together for tournaments. At INDUK we believe in nurturing champions, therefore prior to any competitions, our coaches would conduct extra training sessions to ensure students are adequately prepared and equipped to take on the challenges. While these training sessions focus on techniques , it also builds mental preparedness and confidence. To cultivate continued interests and to reflect a multi-faceted side of taekwondo, we have also started a demonstration team. Students who display keen interests to learn more about the sport, would be invited to participate and train for events in which the school has been invited to display and promote taekwondo. The extra training sessions, would incorporate techniques learnt during regular classes to music and rhythmic beats and board-breaking. For more of our students’ action participating in Competitions & Demonstrations, visit our Facebook photo gallery.